April 8th, a Saturday. A big Saturday! Poetry and music were on the horizon. I paid bills, showered and drove eight miles to the Brewster train station. The metro train was on time, I boarded and I was on my way. The waters of the Croton reservoir gleamed under the strength of a springtime sun. The climate was warm. The swans, geese and ducks were cruising slowly over the ripples while turtles were sunbathing under golden rays. I settled into my train seat like an owner of a luxury sedan settles behind a finely crafted steering wheel. My train pulled into Grand Central station right on time. I snatched my small roller bag from the baggage rack and off I briskly walked to the main concourse. I was a man on a mission. The first stop would be my hotel. I had a certificate for a free night stay at a nice hotel chain and I used it for an overnight stay in New York City. The hotel was on West 37th street. That was only a few blocks from Grand Central Station on 42nd. I just walked out of the station through the Vanderbilt Hall exit, headed west up 42nd street, turned left on 5th, walked 5 blocks, turned right on 37th and 1 block later i arrived. After check in I went up to my room, rinsed off my sweat in the shower, dressed in a navy blue blazer, a long sleeved shirt with dark stripes, gray slacks and high top dress shoes. I left the hotel and flagged a taxi and headed down to East Houston and Bowery. My taxi driver dropped me off at Bowery and Bleeker. There was too much traffic for him to make it to East Houston. I walked a few blocks to the Whole Foods store, picked up some chicken and veggies from the hot bar and headed east on East Houston. People watched as I ate right out of my carry out box as I walked. I finished my meal eat right before I arrived at the Parkside Lounge and threw the box, rattling with chicken bones, into the trash receptacle that sat outside the lounge door. The Parkside Lounge consists of a sports bar in the front section as you enter the lounge door. If you walk through the sports bar to the very back you will see red velvet curtains hanging over an entrance to the special event lounge. The special event lounge contains a stage, nice table and chair seating, booth seating, sound and light systems and more. That night however, before I saw the curtains, I saw the crowd. I saw the crowd and I felt the energy. Tonight was night two of The InspiredWordNYC’s seventh anniversary and it was an electrifying night! The program that night would take place before a packed house. Singers, musicians and comedians took command of the stage as well as taking command of hearts and minds. 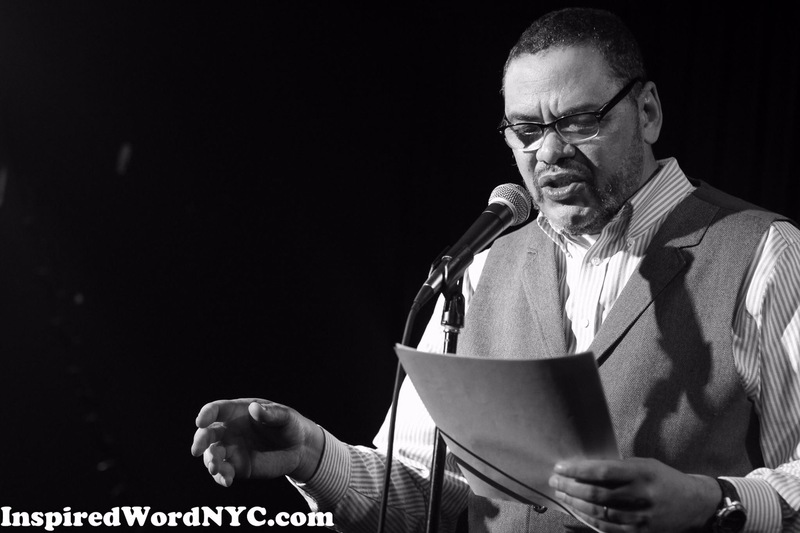 The spoken word artists ranged from poets who read from paper, poets who memorized, poets who were marvelous storytellers and poets who were sensational at improvisation. I remember that thinking to myself “Happy National Poetry Month” as the singers sang, the musicians played and the poets delivered poetic verse! I do not want to forget the comedians, whose routines cracked us up. Honor goes to the hosts who kept things moving right along in a lively manner. Lastly but not least, honor and gratitude to the founders of InspiredWordNYC. Thank you for better my part of my celebration of National Poetry Month!